Great if you have children. Very roomy with tons of storage. Ideal for long road trips. I like my vehicle because it is very roomy. Three children definitely need room so the quest gives plenty of that. It does have a built-in DVD player which is excellent for long trips. There is also a ton of storage which I love. The seats fold completely down when needed for convince. Some of my dislikes include the gas mileage. It doesn't get horrible gas mileage but could get better. I also wish it had a few more advanced features like Bluetooth, Sirius radio capability, etc. however, it was made in 2006 so those should not really be expected in that year model. Overall it is a good, dependable vehicle. My 2006 Nissan quest is awesome and I am glad I bought it for my family. It is a great vehicle. Maintenance is not an issue as long as you keep up with what needs to be done. For someone like me who do not know a lot about cars the features are awesome the DVD player and the CD player and stereo all work great and the kids love it especially my three year who just wants to go sit in the van sometimes to listen to his favorite song or watch his favorite movie. The only thing I dislike is the traction. Me vehicle is good on gas too because I can travel long distances and hardly use a lot of gas. Nissan quest: the perks of a minivan. My car is very large but not tool large. I like the size of the car. It has great storage space for shopping. The car is great practice for driving large vehicles. I like how easy it is to drive the car. The car also has a great seat adjustment system for short people like me. 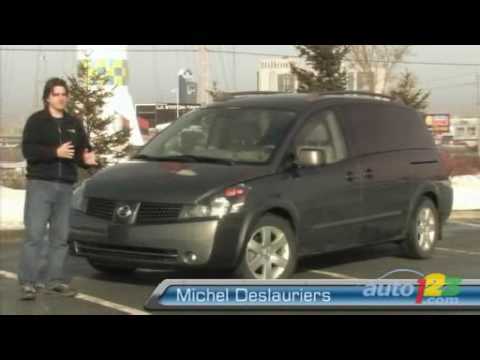 The Nissan quest is also a very sleek design the very appealing to the eye with great color choices.